Twelve years in development, Edwin Boyd is based on the true story of a WWII vet and family man turned bank robber. Frustrated and disillusioned by his post war circumstances, Eddie Boyd is a man torn between the need to provide for his young family and an unfulfilled dream to head to Hollywood to become a star. When he discovers a way to satisfy both needs – robbing banks “Hollywood style” – his dream for stardom leads him down an unexpected path of gangsterism, danger and tragedy. 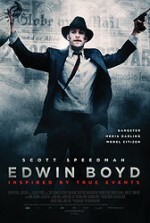 Northernstars.ca reviews Edwin Boyd: Citizen Gangster.